Just to keep things interesting around here (since we don't already have enough on our plate), Ricky and I have refocused our house hunting goals. We haven't ruled out building altogether but as of right now we are leaning more towards purchasing an existing home for several reasons. First, we are finding that we would be able to get A LOT more home for the money and second, the time frame for building the house we originally set out sights on means definitely not getting settled back together as a family until May/June 2014. With all that said, we've been keeping an eye on houses that are for sale and a few weeks ago I saw a gem that I couldn't pass up. I called our realtor, asked her to set up an appointment, and drove to Louisville the next day to take a look in person. It was perfect. As I compared the pros and cons of this 10 year old house to our plans for building, it totally came out on top. Some of the things we would sacrifice if we chose to build were: a finished basement, an office, a 5th bedroom, an eat-in kitchen, a garage large enough for both cars AND storage, and some of the "extras" that tack on additional costs. This house has all of the above and then some. So, I took a TON of pictures and attempted to FaceTime with Ricky - after all, he was going to have to make a decision on whether to put an offer in on this house without ever having seen it himself! And...we ended up doing just that. We thought for sure there was no way the sellers would accept a contingency offer but we decided to give it a shot. Guess what? They accepted it! They gave us 30 days to sell our home in Texas during which time they would list it as "pending" and agreed not to show it or take back up offers. They also wanted a home inspection done within 10 days. Less than a week later Ricky was on a plane to KY. The timing of all of this worked out beautifully - as this meant Ricky would be in town for a whole slew of major "firsts". He got in on Tuesday night and surprised the boys Wednesday morning for their first day of school. After they got on the bus, we headed to the hospital for an ultrasound where he got to see the baby moving around for the first time (I had already had 2 ultrasounds but Ricky was in Texas and they have a strict NO PHONES policy so he was out of luck until now). We didn't make it back to NKY in time for the boys first Karate class (thanks for taking them Nana!) but Friday brought Hudson's 1-year photos and Ethan's soccer practice. On Saturday Ricky got to see both boys rock it in their soccer games and afterwards we spent a few hours as a family at the pool. He had to head back to Texas on Sunday - and there was no shortage of tears as we said goodbye. We don't exactly know when he will be back but the best case scenario is not until mid or late September. While the not knowing is difficult, we are very thankful it worked out to where he was able to be here for all of those very important "firsts". In the meantime, the boys and I are settling in to our routine here and keeping our fingers crossed that our house sells soon so we can move forward with buying the one we found in Louisville. We've buried St. Joseph and are saying lots of prayers -- we would appreciate anyone willing to say some on our behalf as well! Saying lots of prayers that your house sells! 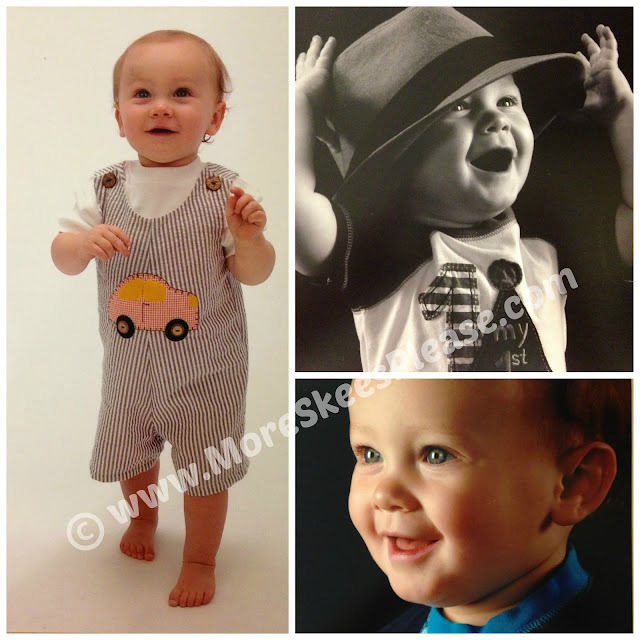 Hudson's pictures are ADORABLE! I hope the boys like their new school!